Want to play at casinos online successfully, safely and profitably? Here you can read our useful tips for gamblers and enjoy your casino online gaming experience making wise and sophisticated decisions in blackjack, roulette or even slots online! From now gambling is will be less complicated for you. You know where and when to play bet to make a huge winning. Profits come each time you gamble! You just need a few minutes to learn out some of the basics. Is casinos online gaming safe? Do they protect their players by means of reliable and trustworthy security measures? Find the answers to these questions, get to know how to choose safe casino online recourses and many more. Baccarat is a popular casino game of chance, famous worldwide as blackjack or poker. Baccarat is not that complicated and requires less practicing and skills training. Baccarat history is very rich on interesting events and famous players who contributed to its development. Let us consider the baccarat games players as popular as famous poker players around the world. James bond is definitely the most famous baccarat player for all game history. Although he is a fictional character, no real player can overcome his popularity. Secret Agent 007 played high stakes baccarat and that was done in such a great manner with his famous shaken and not stirred martini. The first movie with James Bond where he played baccarat games with the bad guys was "Casino Royale". Apart from it, Bond played the game in many other movies such as "Dr. No", "On Her Majesty's Secret Service", "Golden Eye" and "For Your Eyes Only". It is considered that baccarat has gained its worldwide popularity after James Bond movie. The film was a kind of introduction to this interesting casino game. Tommy Renzoni is a mysterious person as he is described as the hotel executive or even as the gangster in different sources. However, he is famous worldwide as "Father of American Baccarat". Renzoni started playing baccarat in late 50s in Cuba and brought this game over to American casinos in Las Vegas. It was a new game but he managed to persuade managers to open baccarat tables. After a while the game became popular and other Vegas casinos opened their doors to baccarat players. Tommy Renzoni not only brought introduced baccarat to American gamblers but also wrote couple of important baccarat books such as "Renzoni on Baccarat" & "Baccarat: Everything You Want to Know About Playing and Winning". Another famous baccarat representative is Akio Kashiwagi AKA the Warrior. Akio was a rich real estate investor. Akio liked to live and play big. If we have a look at his winning and losses, we will see that he placed really large bets and the winnings as well as losses were also big. For example, he snatched a large sum in Atlantic City by betting $200,000 that resulted in winning $6 million; playing big that year again Akio finished with $10 million loss. The death of the wealthy Japanese player was a tragedy as he was stabbed in 1992 and his murder was never solved. The site contains useful and true information on choosing trustworthy online casinos and helpful tips for successful gambling. Moreover, read the gripping stories about the most famous people in the gambling world! Blackjack Hall Of Fame is the institution honoring successful blackjack players, thinkers, writers and everyone contributing to blackjack development. Know the people influenced the game and how. Baccarat is one of the most famous games of chance. 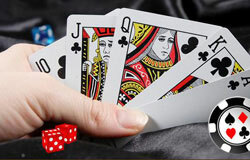 It is played worldwide in many land and online casinos but not many people manage to do it successfully. Get to know the most talented baccarat gamblers. The game roulette is very tempting! It attracts lots of players worldwide. But how to become famous when playing this tricky game of luck? Read the stories about the most famous roulette gamblers. Copyright © 2019 CasinoPersonalities.com. All rights reserved.